On our trip home from Quantico and then our move across the country we listened to quite a bit of audio books and podcasts. Here is my little review of them all! 1. 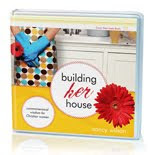 Building Her House by Nancy Wilson- I give this one a big thumbs up! The woman reading this aloud places her emphasis on words weirdly and sometimes it makes the point come across a little cheesy but if you can get past her voice the wisdom in here is great! Its also broken up into quick sections so it is great if you are struggling and need a quick refocus! 2. 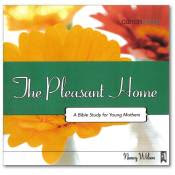 The Pleasant Home Bible Study Series for Young Mothers- This one gets an even bigger thumbs up than the previous Nancy Wilson Audio Set! Brian and I actually listened to this together and we are both really glad that we did. It is nice for Brian to be able to hear where I am coming from and what I am striving for. Brian even made the comment that Nancy Wilson is a very wise woman! 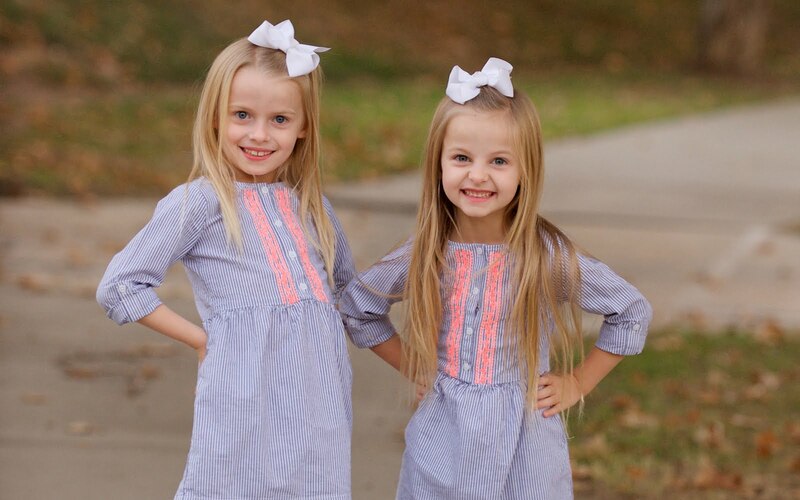 I especially liked the parts about discipline because we are definitely getting to that age with Kenley and it is such a confusing stage for new parents. I have re-listened to this whole set again and I absolutely love it! Each time you listen you come away with something fresh. 3. 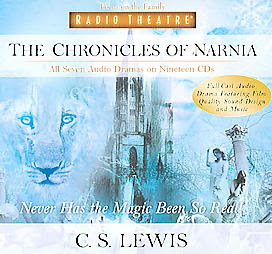 The Chronicles of Narnia Audio Book Series- I am going to give this one a 3/4 of the way up thumbs up. I have never actually read The Chronicles of Narnia books so I was really excited about these and I think maybe I had my hopes too high for them. I really enjoyed The Lion, The Witch, and The Wardrobe, Prince Caspian, and The Voyage of the Dawn Threader. I can see why those three were chosen for the movies! Personally though I felt that the other books were a little lackluster and they seemed to drag on. That could just be the voices that were used to portray the characters in those books though so I still plan to actually read all the books before I place my final opinion on the series. We weren't big fans of Aslan's voice either it just seemed so fake, in fact my dear husband still walks around speaking in "Aslan voice" just to drive me nuts :). 4. 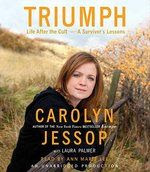 Triumph by Carolyn Jessop- I give this one a thumbs down, so much so that we actually stopped listening after 4 of the 8 cds. I really enjoyed Carolyn's first book, Escape, but this book was not like that book at all. I thought that this book would be much more about the raid that happened on the Texas Ranch run by her ex-husband but instead it turned from being about that to being a self help book about not relying on men. I understand that this woman has been deeply scarred by the FLDS and the men who were in her life until she escaped, but the way she spoke of it was almost degrading to me for relying on and loving my husband. The way she presented ways for women to help themselves was not Biblical at all so we just really couldn't stand listening to the rest of it. Its a shame because I really loved Escape and I was hoping that this book would be similar. 5. A Podcast by Pacific Baptist Church in Long Beach, California- Super big thumbs down! While on the trip we thought we would listen to some more Biblical marriage specific things since we had enjoyed Nancy Wilson's stuff so much but what we came across was borderline heretical. It was a series on the family but mostly about men. -If you give your 14 year old a cell phone you are a bad parent (yeah I totally disagree with that, in this day and age cell phones are becoming necessary especially if there is no home phone in the house). -If you have boys you need to make them fight everything out even if its during church, just let them wrestle and be masculine (What?!?! Doesn't a true man know when he needs to exercise self control?). -Women left to themselves will make their sons effeminate (I really dont think that that is true for Christian mothers who truly understand the Bible). -Men don't like church because the women are aloud to decorate the church. (If you aren't going to church because you don't like that they have a flower arrangement in the sanctuary there is a different problem going on and its not the decorations). -Men are to lead their wives (That is Biblical...just wait though), Women are not to have any leadership or input in the home (That is not Biblical, The home is to be our domain and women are still to express leadership over their children even if the children are boys). The speaker of this section even went as far as to share some of his wife's faults and times where she didn't submit to him (You should never share your spouses faults with anyone, let alone a whole congregation!). Probably the most ridiculous part of the whole thing was how badly they took 1 Peter 3:7 out of context! "Ye Husbands, in like manner, dwell with [your wives] according to knowledge, giving honor unto the woman, as unto the weaker vessel as being also joint-heirs of the grace of life; to the end that your prayers be not hindered." I highlighted the word that he based everything on, not even the whole word used in the Bible! He kept saying that the woman was weak and the man was to be strong! UGH!! It drove me crazy! This kind of man and what he speaks for totally makes women want to be ANYTHING but submissive to their husbands! Women were created with a different purpose than men! That is not a bad thing! It is a God-intended thing! Okay, I will stop ranting :) The only reason that we continued to listen to the series was that it sparked fun conversation between Brian and I about how ridiculous their stance was and what the Bible actually says about those topics. So there is my review of what we have listened to recently, Do know of any good audio that I am missing out on and need to listen too? Thanks for sharing Keri. That last one sounds infuriating! How did you even find it? I am intrigued by your review of the Nancy Wilson ones. As we have talked about, I have learned some really great things from her but sometimes I find her tone to be condescending...were these books different? I'm just leaving this comment because I want to check the box that has further comments to be emailed to me. I forgot to do it the first time. I actually love her more now that I have listened to The Pleasant Home where it is actually her speaking! She actually comes across so sweet. I think that you would really enjoy that series! I miss you! Give Lily a big hug from me! Thanks for the reviews, that last one was good just to keep you on your toes about the truth, eh?! I am a HUGE Chronicles of Narnia fan(I may have said that before in a previous comment!). Please, please read the books, I have read and reread them all numerous times. Glad you all got there safe! I love, love, loved the Pleasant Home. I listened to it as did Jake, at times, and was entirely renewed and refreshed in my parenting.